Waterproofers have traditionally relied on various forms of applied membranes to contain moisture. Products such as torch-on bitumen, modified bitumen, acrylic emulsion, polyurethane emulsion, liquid rubber, polyester resin and fibreglass and many other types of membrane have been widely used. Many of these products work well but there is a revolution going on in the world and its called POLYUREA. 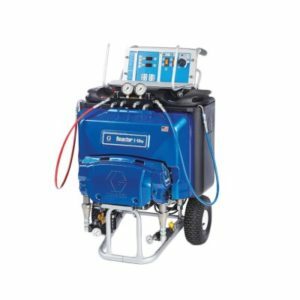 Now with Graco's newly released Reactor E-10hp, waterproofers have an economical and superior alternative to traditional membranes. The amazing E-10hp can easily be wheeled through doorways, into lifts, down hallways and into bathrooms. All it requires is 240v and a small portable air compressor. Fitted with a Fusion-AP gun and AW2222 mix chamber and up to 33m of insulated hose, access to almost any area is simple and easy. When fitted with the correct spray nozzle there is no overspray and no fumes as polyurea is a 100% solids product and contains no solvents or VOC's. Elaston polyurea is made in Australia under ISO9001 by one of the world's largest chemical suppliers and is a pure-polyurea by definition of the PDA. Each batch is tested for quality and a sample retained for future reference. Call us now on 07 3277 6655 and speak to one of our friendly staff about Elaston-W80 and the E-10hp. Units available for demonstration at our Rocklea premises.